Samsung Chairman Lee Kun-Hee ..
Samsung Group said on Jan. 16 it has promoted or replaced 25 chief executives at its affiliates and reorganized its flagship Samsung Electronics Co. into two major business divisions, in a sweeping management reshuffle intended to fight off the global economic crisis. Samsung Electronics, the crown jewel of South Korea's largest business conglomerate, has been hurt by sinking global demand for semiconductors and flat-panel televisions amid the financial turbulence. Under the reorganization, Samsung Electronics' four business divisions were reorganized into two — the Device Solution division of semiconductors and liquid crystal display panels and the Digital Communication division of home appliances and mobile phones. Samsung Electronics Vice Chairman and Chief Executive Officer Lee Yoon-woo, 63, was named to head the chip and LCD division, while the company's handset chief Choi Gee-sung, 58, was promoted to vice chairman to head the consumer electronics and mobile phone division. Choi is known to be a close confidante of Lee Jae-yong, the only son of former Samsung chairman Lee Kun-hee and now being groomed to take the leadership position. Vice Chairman Lee Ki-tae of the mobile phones division and Vice Chairman Hwang Chang-kyu of the semiconductors division, two old guards of Samsung Electronics, have departed, the group said in a statement. Lee and Hwang, who are dubbed "Mr. Mobile Phone" and "Mr. Chip" by local media, have overseen the company's rise in the two sectors over the past decade. The reshuffle marks the first restructuring effort since the group's former chairman stepped down in April last year in the wake of a parliament-ordered corruption probe that led to his indictment for tax evasion and other charges. In October last year, an appellate court upheld a lower court's decision to give Lee a three-year suspended jail term. Investors were muted. Shares of Samsung Electronics were unchanged at 459,500 won at one point in afternoon trading. "Young and talented executives were appointed to overcome the current global economic crisis," the group said in a statement. Samsung Group, which accounts for about 20 percent of South Korea's annual exports, consists of 59 affiliates. 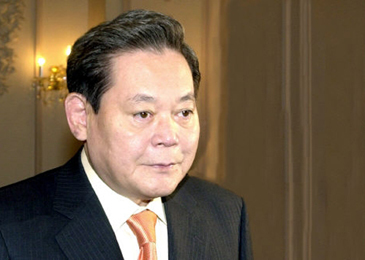 Samsung Heavy Industries Co. CEO Kim Jing-wan, meanwhile, was promoted to vice chairman of the company. Twelve chief executives at Samsung affiliates were replaced, the group said.